Charming village house with 170 m² of living space and possibility to create a gite. France, as a very near neighbour of the UK, has many similarities which, when combined with its natural advantages such as the beautiful countryside, a warm, sunny climate, excellent food and wine, appealingly low property prices and friendly people, make it extremely attractive to British people who want to either own a holiday home overseas or make a full time move to a more relaxed lifestyle (Life in France). The lure of France is too great for the little differences to deter us. There are, however, several "little" differences other than language that may make us pause for thought. They are certainly far from insurmountable, but they need to be considered as part of the learning curve, perhaps, and given due consideration! One such is electricity or the electrics in France. If you are renovating (House Renovations in France) or building a new property in France, then electricity in some form or other is almost bound to feature. If you are buying a property that is fully ready to live in, requiring nothing other than maintenance, you may be lucky... but chances are that at some point, even you will experience some sort of electrics problem that needs fixing, and if you have some understanding of the way things work it can save you money and further problems in the future. At this point you may also be thinking; "But I will simply call an electrician, what do I need to know?" Perhaps you have a point... but maybe it would still be helpful if you could explain what the problem is, to enable the electrician to turn up equipped to solve it for you. There are also some key differences in the way that electric power is supplied and delivered in France from the way it is in the UK, and knowledge of these can actually help you to avoid problems. Perhaps the first and most obvious difference that you will be aware of is that the plugs are completely different in France from in the UK. In the UK, you will probably have been used to square shaped plugs that have three pins, whereas in France you will find the plugs are of two different types, with only two visible pins. One type is small and flat, and these do not contain an earth. The other type is bulkier, still with only two visible pins, but these contain a hidden earth. The sockets need to correspond to the plug type. Within a plug of the type known in the UK, you will usually find three wires. These are a brown one (live), a blue one (neutral), and a yellow and green one, which is the earth. The brown wire (live) always goes to the live side of the plug, where the fuse is found. In France, it is not so straightforward. The colours are the same, which is a start, but the blue and the brown wires can lead to either side of the plug. The earth lead is also almost always missing. The other thing that you might notice, is that there is no fuse. It saves you having to learn how to change one anyway! Houses which are on a low supply may be unable to sustain modern electrical equipment, and people who have bought old properties to renovate often report being unable to boil a kettle without activating the circuit breaker if a light is switched on at the same time! If you have bought such a property, you will almost certainly need to apply to have the supply upgraded. Nigel Green, an electrician working in the Aude (Aude Property Guide) and Ariège (Ariège Property Guide) departments of southern France (Property in the south of France, South-west France Property), has a cautionary note to add on this subject. He has found that electric power showers, so beloved of many Brits, step up the power requirement considerably, and strongly advises against installing them. Do electrical goods bought in the UK work in France? Most modern electrical appliances such as televisions (Television in France and French TV), stereos, washing machines and microwaves can be brought from the UK and installed in France with no more than a simple change of plug. (There are certain considerations regarding circuit breakers, but these will be discussed in the next section.) It is possible to obtain converters, but these should really be regarded as a temporary measure. It is not, however, a good idea to bring wire, switches, or sockets from the UK. The specification of these is different from that in France, and the two are not compatible. The way in which houses are wired is also different in France. French houses are wired using a point to point electrical pattern rather than the loop (ring main) that we are used to in the UK. The system in France involves a series of spurs running from a distribution box. Most of these can support several sockets and fittings, but large household appliances such as washing machines, hot water tanks or dish washers must have their own individual spur. It is necessary to have a circuit breaker that can supply up to a maximum of eight sockets if you use 2.5 mm cable, or up to a maximum of five sockets if you use 1.5 mm cable. For the lighting, it is necessary to have a circuit breaker for up to a maximum of eight light points using 1.5mm cable. A light point is defined as any connection on the wall, ceiling or in the ground where a light fitting could be connected. In France, the householder has the responsibility of ensuring that the property has a properly connected "earth", as unlike in the UK this is not part of the package when you arrange for connection to the national supply. The usual way of fulfilling this requirement is to have an independent earth connection which is connected to an earthing rod buried in the garden. The normal procedure for remote sites is to use a generator (or two) to power mixers, festoon lighting, tools etc. The higher the output capacity, the more kit it can supply simultaneously, but it consumes more diesel and you will need transformers. All excavation, trenching, dozing etc. is by diggers. The client, through their agent or builder, applies to the electricity company for a supply. The company visits the site and prices a plan of work e.g. : one LV transformer, fifteen pylons, 450 metres of LV cable and a pillar, and give a date for installation subject to receipt of deposit. You can request timber pylons rather than concrete ones, though this is not always remembered. No supply up to the pillar will be interred rurally, and the pillar must be no more than 25 metres from the house intake and consumer unit if the cable to them is to be trenched. This is relevant if you don't want cables dangling around and up to your house. Your electricity supplier's responsibility is to the pillar, the client's responsibility is from the pillar to the house. Once your electricity supply to the pillar is installed, the builder will then take a supply from it for his lighting and tools which will allow him to off-hire the generator, stop supplying fuel, and transfer the cost of running his site/tools/power/light to the client, even if he has priced it separately in his prelims, one to watch out for at final account." Once you are all wired up and connected to your electricity supply, and settling down to enjoy your French home, there are still one or two things that you should be aware of. France, in particular in the mountainous regions (of which there are many! ), is susceptible to some spectacular thunder and electrical storms (Ski Chalets for Sale in France). Whilst these can be more entertaining than French television, they bring with them potential electrical problems, in that French electrical systems are prone to lightening strikes. To avoid difficulties, if you do not have a special protector fitted to your distribution box you should unplug electrical equipment such as telephones, computers and televisions during violent storms. Doing your own electrics in France? Finally, it is also worth mentioning that if you do decide to do work on the electrics yourself, at the time of writing, this is possible, with no certificate or check needed by a qualified electrician once you have finished, as is necessary now in the UK. However, things are changing all the time, and this may well not be the case in the future. At the very least, electrics will most probably have to be checked when a property is sold, these checks possibly running along similar lines to those checks that are currently done for termites and woodworm. Eyrolles Editions has just published the first English guide to electrical wiring in French homes, entitled "Electricity in your French House". It is by Thomas Malcolm and may prove to be an extremely useful book. I have just seen your site. We are having enormous problems with EDF. Too much to mention here. Is there anyone in France who can help us to reach a resolution with crazy behaviour. European Parliament is talking of an investigation. Thanks for contacting us. As you don't mention the extent of the problems you have with EDF, I am not quite sure how far down the line you have gone, so I apologise in advance if the following suggestions are not quite what you had in mind. Firstly, if there is a problem with language, perhaps you could try the English-speaking EDF helpline, which can be called from within and outside France. The number, from the UK, is 00 33 (0)5 62 16 49 08. I hope one or some of these suggestions might help with your problems. 1. Would he be allowed to do this work himself or would we need some sort of certificate - especially if we come to sell the house at a later date? 2. Can we purchase the wall heaters in England (they seem to be so much better value for money than buying them in France) to install in France or are the electrics completely different? Thanks for contacting us. I would say it should be fine to do the work yourselves and buy the heaters in the UK, though as I am not a qualified electrician you may wish to check with one of the electricians listed on our site to get a more accurate answer (http://www.frenchpropertylinks.com/memberscat.asp?category=ELECTRICAL). Currently no certificate or check is needed by a qualified electrician, though checks will probably need to be made on selling. My colleague Joanna in France says that sometimes French property buyers can be very picky and want to see work signed off by the right people for everything, while others don't seem to care. So perhaps it will luck of the draw when you come to selling. Hi! I have a question from the other perspective. I have a French wall light which I want to install in the UK! It has a section to receive a live and a neutral wire, but does not appear to have a section for the Earth (because they don't tend to have them). Any ideas where i can insert the earth wire from the wall to keep this all safe? Thanks. Thanks for contacting us. I understand that if the light is in a metal case (or any other conductive material) it needs to be earthed, so attach the earth wire to the metal. If it is of a non conductive material, there is no need to earth it. We have a house in the Deux-Sevres region with an electricity supply and are doing a renovation job on a small cottage in the garden. My son who is a UK qualified electrician is wiring the house under French rules but we need to know would it be ok to use a UK fuse board or must it be French? Thanks for contacting us. I have been trying to get an answer for you, but have had no luck. Perhaps you could try contacting some of the electricians we have listed under our Business Directory, to see if they can offer advice? I'm sorry not to have been of much help. Can you confirm what I believe I understood from reading the French regs in French! When counting sockets, two outlets within the same containment (a double socket) counts as one; which means that 5 on 1.5 or 8 on 2.5 is actually ten and sixteen respectively. Thanks for contacting us. Though I am afraid I cannot help you, apart from suggesting you contact an electrician based in France, perhaps using the Business Directory on our site. Please can you confirm that it is still legal to do your own re-wiring in France or has the law changed? Not sure how current the above article is. Thanks for contacting us. I have been in touch with someone whose husband has been an electrician in France for nine years, who says that they are not aware of any changes to the law. You can still re-wire yourself. The installation must meet French regulations though. A certificate of conformity will be needed should you come to sell your house. And, if there are any sorts of grant involved, the work may have to be carried out by a nominated tradesman. I am buying a house in the Aude and the electricity report is saying the supply is not earthed. How much would it cost to do this? I am in the cooling off period of the Compromis and wondering if I should pull out. Thanks for contacting us. I would suggest you contact an electrician to get an idea of prices for this, perhaps using our Business Directory. I WISH TO VISIT FRANCE, PLEASE TELL ME THE VOLTAGE SYSTEM i.e. 110v OR 220 v SYSTEM, AS WELL AS TYPE OF THREE PIN PLUGS IN USE. WHETHER EQUIPMENTS WORKING IN INDIA WITH 220V CAN WORK THERE. THANKS. Thanks for contacting us. Our above article describes the plugs used in France, which are of a two-pin type. You will need an adaptor plug to use if you have three-pin plugs. I am not sure if equipment working India would work in France, but I see no reason why it shouldn't. I believe the voltage in France to be 220-230V. For expert advice however, I would suggest you contact an electrician working in France, perhaps using our Business Directory. How can I find out the email adress of Fabrice Allende, electrician in Le Lot et Garonne 47260? Thanks for contacting us, though I'm afraid I cannot help you. Have you tried Pages Jaunes to find your electrician? Or perhaps asked at your Mairie? Though should anyone reading this know of this person and have contact details, please get in touch and I will pass them on. I am a fully qualified electrician in the UK and have purchased a very old house in Normandy. It has three phase electrics, can I wire it the same as UK ring mains and lights with UK plugs and sockets, and light switches? Please let me know. Thanks for contacting us. Though I am afraid I cannot help you, apart from suggesting you contact an electrician based in France, perhaps using the Business Directory on our site. Should anyone reading this be able to help, please get in touch. I would be grateful for some advice regarding the electricity supply that I need in my French house. I bought the house with a single phase 6KVA supply which now needs uprating as I have installed electric heating and intend to install an electric oven. I have spoken to EDF who are very helpful and have offered an upgrade to either 9 or 12KVA. Based on my answers to their questions they have recommended 9KVA but I am unsure whether this is enough based on the 60amps we had in the UK. As you may have guessed this is all alien to me and I have very little understanding of how this is all rated. I would very much appreciate any advice as to whether 9KVA will run a medium sized house with electric heating and water heater, a very active kettle and a future electric oven plus the usual everyday appliances. Thanks very much. Thanks for contacting us. Though as I am no expert in these matters either, I would suggest you contact an electrician based in France for accurate advice, perhaps using the Business Directory on our site. Should anyone reading this be able to offer advice, please do get in touch. Hi - I am planning to do some electrics for a friend of mine, in the south of France in the summer. What he requires done, is to upgrade an existing consumer unit from cartridge BS1361 fuses to MCBs. Do all MCBs in France have to be double pole type or can you use single pole type as the UK? Thanks for contacting us. Though as I am no expert in these matters, I would suggest you contact an electrician based in France for accurate advice, perhaps using the Business Directory on our site. You could also perhaps look at the book entitled "Electricity in your French House" which we mention above. It is an English guide to electrical wiring in French homes by Thomas Malcolm, and may help you with this. What are the regulations for having a plug socket in a bathroom in France? Thanks for contacting us. Though as I am no expert in these matters, I would suggest you contact an electrician based in France for accurate advice, perhaps using the Business Directory on our site. You could also perhaps look at the book entitled "Electricity in your French House" which we mention above. It is an English guide to electrical wiring in French homes by Thomas Malcolm, and may help you with this. We are having electrical work done and have stone walls. In the kitchen we want an industrial look, can we conduit wires in aluminium tubes as in UK and have non flush sockets or do they have to be plastic? As the answer above, I'm afraid I can only suggest you contact an electrician based in France for accurate advice, perhaps using the Business Directory on our site. You could also perhaps look at the book entitled "Electricity in your French House" which we mention in our article. It is an English guide to electrical wiring in French homes by Thomas Malcolm, and may help you with this. We want to boost our 2x showers and are considering installing a dual pump. Will this work in a traditional French system, ie no header tank? Thanks for contacting us. Though as I am no expert in these matters, I would suggest you contact an electrician or plumber based in France for accurate advice, perhaps using the Business Directory on our site. Should anyone reading the above question be able to offer advice, please do get in touch. Can anybody tell us if UK light bulbs/lamps will fit French lampholders/fittings? Merci. Thanks for contacting us. I understand UK lamps may be able to be used in France, though it may take some re-wiring work, but I'm unsure if UK light bulbs are compatible with French lamps. You also need to watch out for insurance cover in France, as installing UK electrical items may pose problems. But as I am no expert in these matters, I would suggest you contact an electrician based in France for accurate advice anyway, perhaps using the Business Directory on our site. Should anyone reading this be able to help, please do get in touch. I have been told that if EDF have supplied your domestic electicity supply, then a 3 phase supply will be available from the same supply box, without any difficulty. Is this true please? Thanks for contacting us. I would suggest you contact some electricians who work in France for their advice, perhaps using our Business Directory. When letting a house, do you need a certificate of completion for major electrical works done by yourself? Thanks for contacting us. Though I'm afraid I don't know the answer to your question. Perhaps you could check with your letting agent if you have one, your insurance company or your Mairie? Or maybe ask an electrician? You can find some listed in our Business Directory. We are in the process of re-wiring our house in France. When the house has completed it's renovation we aim to "let" it for holiday purposes. Does the fact that we are re-wiring the house ourselves (not qualified electricians but working to French standards) cause any problems with holiday visitors? Will it need to be certified for insurance purposes also? Thank you. Also, how do we go about installing a telephone line in the property we are renovating in Normandy ? Thanks for contacting us. I am not sure if you would now need checks done or certification with electrics/re-wiring (it didn't used to be so), so I would check with your Mairie for the current rules on this. And certainly check with your insurance company, as you definitely don't want to find out your insurance is not valid just when you need it. You could also check with some electricians, perhaps using our Business Directory. Of course, should you wish to sell your house, you would need certification, as you would if you were installing electricity for the first time. Regarding getting a telephone line installed, you should be able to find out what you need to know in our article "Connecting utilities (water, gas, electricity, telephone and sewage) in France" (http://www.frenchpropertylinks.com/essential/utilities.html). I would like to build a workshop in my barn. At the moment there is one socket and two lights, both supplied by a 2.5amp cable from the consumer unit in the house, with a 16amp cartridge fuse. Can I install a second small consumer unit in place of the one socket in the barn that019s supplied by the 2.5amp cable and then connect my pillar drill, table saw etc to this unit with their own fuses? Should anyone reading this be able to offer any advice, please do get in touch. We bought our French house in 2006 and rewired it ourselves in 2007/8. We are thinking of putting it on the market now and hear that a certificate of conformity may be needed. Does anyone know what the certificate covers and who issues it? Thanks for contacting us. I understand that from 2009, a diagnostic electrique or inspection report is required, as part of the Dossier Diagnostique Technique (DDT), before a property can be sold, unless you have had an inspection by the Consuel within the last three years. This report also lasts three years. I understand it is to basically say that your electrics are all in good working order. An accredited inspector must carry out the work. I would think you could contact your local Consuel office to find one - their main website is www.consuel.com. Our article "Diagnostic Immobilier and selling property in France" (http://www.frenchpropertylinks.com/essential/diagnostic-immobilier.html) has further details of how to find accredited experts. I am replacing old wall heaters in my house in France. The new one has three wires "phase" - brown, "neutre" blue and "Fil pilote" which is black. The old heater has the same a brown and blue but also a green/yellow earth. My question is what is the fil pilote and should I or do I have to use it? If it is required what is it connected to? Thanks. Thanks for contacting us. I understand a fil pilote is a control wire or pilot wire, used to centrally control different heaters/radiators. Other than that, as I am no expert in these matters, I would suggest you contact some electricians working in France, for their advice. Perhaps you could use our Business Directory. You could also have a look at the book we mention "Electricity in your French House". It is by Thomas Malcolm and covers most things you need to know. Hello - I am currently renovating a house in Lower Normandy and I have a question about electrics. The fuseboard is in the kitchen area of the open plan ground floor. Regulations state that the fuseboard should be in a separate room. Is it possible to house the fuseboard in a cabinet/cupboard in the kitchen to get round this problem? Thanks for contacting us, though as above, as I am no expert in these matters I would suggest you contact some electricians who work in France for their advice, perhaps using our Business Directory. You could also have a look at the book we mention "Electricity in your French House", by Thomas Malcolm. And a visitor to our site very kindly recommended a book published by Association Promotelec called "Locaux d'habitation - Installation Electriques Privatives" (see comment no. 10). Our house has direct system electricity rather than the loop as in England. We have been told that should we sell the house, the buyer must replace this system and up grade it. Is this true? Thank you for any help you can give me. Thanks for contacting us. I am not sure who has told you an upgrade is required should you sell your house, but it might be worth checking with EDF or your mairie, if you haven't already. You could also contact some electricians working in France, perhaps using our Business Directory. My electrician has installed ceiling light fittings, but I do not understand how to change them from a temporary bare bulb which he left there to a permanent suspended lampshade and bulb. How do I do that, and do I need to buy anything special? Thanks for contacting us. I can only suggest you contact some electricians listed on our site under Business Directory, to get their advice. The house used to have a telephone 10 years ago, we have the posts still in the garden (concrete). I would like to have it re installed, is this possible? Thanks for contacting us. I think this would be perfectly possible. You will need to contact Orange (formerly France Telecom). 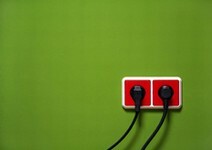 Our article "Connecting utilities (water, gas, electricity, telephone and sewage) in France"(http://www.frenchpropertylinks.com/essential/utilities.html) may be of interest. I found the above article most useful with some helpful information. One item I picked up on is under the heading "Electrics and earth connections in France". It states that one has to provide your own system earth by burying an earth rod in the garden. I think you will find that the requirement is for three earth rods to be connected together and spaced at least one metre apart. Thanks for contacting us. However, I cannot find out from anywhere that laws regarding earth rods in France have changed to what you have said. Thomas Malcolm mentions only one rod in his book on electricity in France, and other electricians my colleague in France has asked also say only one is fine, though one may not always be sufficient in all properties as it depends on the electricty supply to the property. Might you be able to point me in the right direction, so that I can verify this point? I would greatly appreciate it. I believe I got my information regarding three earth rods from a leaflet from Castorama or Mr Bricolage. When I am back in France I will look it out to verify. The norme states that you must have an earth with a resistance which is less than 100 ohms (this is to ensure that your RCD will work in the event of an electrical fault). Unfortunately it is not possible to test the earth without an ohmmetre de terre. The earth can be created in several ways, the most simple being the earthing rod, but the most important factor to consider is not the number of rods but the type of soil and the underlying geography. One 2-metre rod can be enough, but I have personally installed 3 rods in an area with a sandy sub-soil and the resistance was still well over 200 ohms. In this case more drastic action is required, involving a lot of digging and a lot of expensive copper! Hope this is helpful. 1. EU law permits any electrical installation in the EU to be to another members Named Standard. - Named Standard means you can not mix regulations re: circuit protection, cable, routing, accessories. - French installation in the UK must comply with NF C15 10. - UK installation in France must comply with BS7671. You can not use UK cabling to BS7671 (such as Flat Twin & Earth, 6242YH/BH) and hope it complies with the French NF C15 10 standard because it does not! The CPC is a differentcross-section to line & neutral (eg, 1.5mm v 2.5mm) and the CPC is not insulated (bare). Likewise cable routing needs to be AWARE of French Regulations such as not cable chasing too deeply as they must respect French building regulations (just as with UK BR "A"). 2. EU law permits MORE than one electrical installation. - So a French house could have two electrical installations to two different standards. You can have CU #1 serving cooking, heating, lights & sockets to French NF C15 10 (logical as in France!) and then CU #2 serving sockets to UK BS7671 in all rooms, ideally labelling them "CU #2". Going over and wiring entirely to UK standards is not really ideal, although legal under EU law because the next buyer of the house may be French and want to rewire to the same. Some insurers may baulk at an entirely UK install, but if it complies with BS7671 (and they may want a UK qualified electrician to certify it) they technically can not. In reality they can just decline the business as they can with anyone. The practical solution is a) some travel adapters b) some UK sockets on a dedicated UK consumer unit separate from a French system. Anyone "mixing and matching" deserves to have Consuel examine closely or reject, just as Building Control or a Competent Scheme member would in the UK. The rule is "each install to a named standard", not a made up mix. 3. UK law permits all works to be DIY'd, some are notifiable to Building Control, some are not. We have an ancient stone cottage in St Nizier sur Aroux, Burgundy. When we bought it seven years ago there was a fuse board, some plugs and some lighting. Having worked on refurbishing the property for several years in hols and such, we were ready to update and rewire the house. Having done electrics in the UK (diy) I felt confident enough to carry out the works. We had to run all the cables on the surface as there was no way we could chase out for the runs. The walls are stone so we ran all the cable in conduit, five plugs in dining room, five plugs in sitting room and eight in the kitchen. We managed to do this quite easily as we bought a book online. I would recomend this little book to any competent person. The book explains the caling system, consumer unit, earthing, fuses, circuit breakers, lighting, electricity in the bathroom, kitchen, in fact everything you would need. We have now completed the wiring and it all works and is according to the French wiring system. THE BOOK IS CALLED "ELECTRICITY IN YOUR FRENCH HOUSE - RULES AND TECHNIQUES EXPLAINED IN ENGLISH". It is written by Thomas Malcolm (ISBN 978 2 212 12712 6 TOUTES DROITS RESERVES). Try it, you will be amazed. The quotation given to me by a local electrician was 5,000 Euros. My actual layout cost me two weeks work plus studying the book, and completion of the work was 250 Euros. Electrical principles and practice are the same in France as in the UK. Do visit Castorama and look at the devices and cabling used in France. Do use a RCBO panel as the basis for all safety. Do get the polarity round the right way. It is important. Earthing must be done by the supply company and an earth is always needed. They can use PME where there is no existing earth. Earth rods are often useless so take warning. If appliances bought in the UK are for a 50Hz supply and for 220-240v they will be ok in France (not 230-240v.) Everyone has problems with EDF it seems to me, so ask someone to change you to GDF Suez. In Britain we use a single phase (230v) supply phase and neutral with an earth going back to the star point of the transformer, same as the neutral goes back to. For this reason we only switch and isolate the phase live. The French system only makes sense when it is understood as 220v between phases. Therefore understand there is no neutral in France. For this reason both conductors must be isolated using the French double pole circuit breakers and isolators. If you use British circuit breakers in France, the circuit will remain live in case of a fault, because in France you are working off two live phases rather than one, and using British circuit breakers you will have only isolated on one phase. Whatever EU law may say, unwise to use other than French rules and products. As you state above, French consumer units use double pole breakers, although I don't think the reasoning above is quite correct. As stated elsewhere the earth must have a maximum resistance of 100 ohms, this may be obtained in a number of ways and be measured. It is affected both by the type of soil and the moisture content. Spares for UK products will likely be a problem, French electricians will not like dealing with them and may well refuse to fit them even if they have CE approval, NF is better. Systems must now be approved by a "consuel", before EDF (actually ERDF) will make a permanent connection. An existing installation will escape, at least temporarily. Buy a good guide, there are various ones. Le Grand do two good booklets but you will be better off getting the French language ones and arranging your own translations. 220 VOLTS BETWEEN TWO PHASES, OR BETWEEN LIVE AND NEUTRAL. It is described above that French electricity supply is 220 volts between two phases. That is only in a 220 volt system where you have appr. 115 V between one of the live phases and neutral. Other supplies in France are 400 volts three phase system, as you have in the UK, where 220 volts is between one of the three live phases and neutral. If you measure between two live phases in this system you see 400 V. If you make a wrong connection of your sockets to the fuse cabinet with three phases, your appliance may receive 400 or 115 volts. In Norway the 220 volts system is common, with no neutral connection from the transformer as we don't need 115 volts. Each socket is connected to two of the three phases. Earth connection is from the water pipe or a buried unisolated copper wire. What a helpful, innovative and informative blog. I will be reading this when I move to our new property in the near future. Thanks to all the contributors for both their questions and answers. There is a very useful book published by Association Promotelec called "Locaux d'habitation - Installation Electriques Privatives". It's a guide providing you with all the info to do electrics yourself, and explaining the relevant Normes. It's available from their website: www.promotelec.com. Of course your French has to be good enough for it to be useful, but mine's not that great.